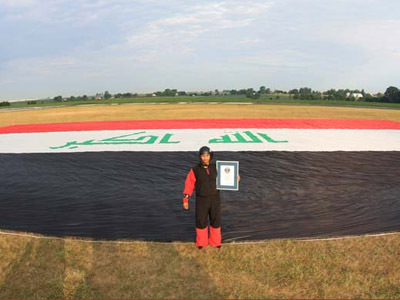 An Iraqi daredevil has set a patriotic world record this week for the largest flag flown while skydiving. Fareed Lafta unfurled the huge 4000 square meter Iraqi flag over the Skydive Chicago facility in the US. Lafta spent two months preparing for the jump. He “trained a lot and was injured a lot,” he told Al Arabiya in an interview. If he hadn’t maintained symmetry in his dive, the increased air resistance with the 115 kg flag could have killed him. In the end, it all went without a hitch. It’s not the first time the first qualified astronaut from Iraq and the first from the Arab world to fly a plane to the edge of space has made skydiving history. In 2008, Fareed became the first person to jump over Everest and, in 2011 performed the so-called ‘peace jumps’ over his native Baghdad and the Afghan capital Kabul.